You know, the United States of America isn’t the only country on the North American continent. USA has a nearly impenetrable neighbor. They’re located due north, past some great lakes, through some unsurpassable forests… It’s Canada, guys. We’re talking about Canada. Canada is great. If you’ve never been, we highly recommend it. Here’s one specifically great thing about Canada: you can learn graphic design up there! This list focuses on schools in the city of Vancouver, which is in the province of British Columbia. Vancouver is a big ol’ seaport city located in the southwest corner of BC. It’s the most populated in city in the province, so it’s no wonder that there are a handful of graphic design schools located there. 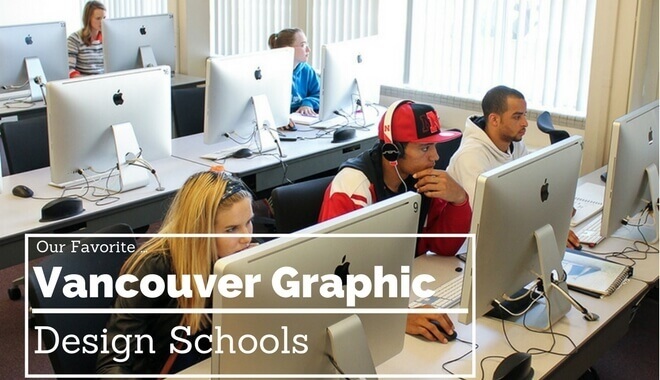 We’ve put together a list of the top 8 graphic design schools in Vancouver, to make your demanding higher learning search just a little bit easier. This isn’t an exhaustive list, but it’s a great place to get started. We look for a number of criteria when choosing schools to list: good tuition pricing, an excellent design program, renowned faculty, and solid overall school quality. The schools selected for our list are top performers in at least one of these areas. Because of our methodology, we don’t rank schools in any particular order. The numbers are there for article clarity, not to indicate rank position. VCAD is well-known for providing an education that won’t pigeonhole you. It prides itself on delivering well-rounded education in the arts. The Visual College of Art and Design of Vancouver harps on wanting to help you use your imagination, creativity, and talent to start a successful career. VCAD tries to keep tuition costs down, at least compared to other schools, which is easier for them to accomplish because of their substantial student base. VCAD provides the classic education model of theory-based learning combined with hands-on application and training. The program at the Visual College of Art and Design of Vancouver provides the opportunity for you, as a student in the program, to build a professional portfolio. This means that you’ll have more than just a diploma upon graduation, you’ll have a collection of work showcasing your talent and your creative problem solving ability. In your final two terms at VCAD, not only will you compile first and second drafts of your portfolio, you will have to defend it as well. Justifying your work means you’re making sure it has earned the right to represent you. This is a 5 term program. BCIT provides you two options in pursuing your Associate Certificate in Graphic Design. You can take the course as a full-time student, completing the Associate Certificate course in a fast-paced 6 month time frame. Or, you can take your time earning your Associate Certificate as a part-time student. The latter route can take up to 5 years, if you need it to, but students often complete it faster than that. If you want to build a career that has real meaning and value, Emily Carr University of Art + Design is a good option. They want you to push yourself on a path that is in tune with not only your goals, but your passions and your values, too. The Design program at Emily Carr University of Art + Design isn’t just a “visual communication” course. The program teaches you communication design within the context of society and the world today, emphasizing the impact visual communication and design can have across a wide variety of fields. If you want to collaborate with other individuals hoping to use their newly discovered design powers for good, Emily Carr University of Art + Design is likely your spot. If you want courses designed to mimic the projects and challenges you’ll face in the field, Emily Carr University can provide that challenge. If you’re not passionate about graphic design, and you’re just doing it for the sake of doing it, another school will probably serve as a better fit for you academic needs. Or, you could try the Certificate program for Communication Design. It’s a one year program in partnership with BCIT (also on this list) that teaches you the essentials of communication design. This is a 12-month diploma course that focuses on design as it relates to web development. It will teach you how to collaborate on assignments, and how to deal with real-life clients. If your interest in graphic design is predominantly web-based, this is a great option for you. The other good news is that, because of partnerships with several schools in the USA, the UK, Australia, and Canada, you could earn an undergraduate degree in just one additional year, if you attend one of the schools they’ve partnered with (see their site for the complete list of these other schools). The Graphic Design program at LaSalle College Vancouver is a 45 week, three semester program that culminates in a Diploma in Graphic Design. It ends up being 900 course hours, in total. This diploma program will teach you relevant skills on the pertinent software from Adobe Creative Cloud Suite (Illustrator, InDesign, Photoshop), as well as the HTML language. There are marketing strategy courses and design principles courses as well. This is a solid diploma option for building your foundational graphic design knowledge and experience. Capilano University encourages prospective students to come to the IDEA School of Design on an Open Studio day. Attending an Open Studio day lets you sit in on a program presentation and tour the studios at Capilano University. You’ll also have an opportunity to meet current students, and if you bring your portfolio (and you should), you can receive some “friendly feedback” on your work thus far. Entry into the design program is competitive, and it is based on a portfolio review (along with the review of other documents required during your application). There aren’t many Open Studio days prior to the program opening every fall, so make sure you look them up early and mark them on your calendar. The Langara school offers a two year foundations-of-design program, which will either prepare you for continued academic study or entry-level jobs. The school encourages all ages to apply and attend, whether you’re fresh out of high school or have several decades under your belt. You’ll develop a strong exit portfolio during your time at Langara, which will help you on your path whether it involves entrance into a competitive program or a job in the graphic design field. There is some ability to specialize, but you should expect exposure to several different design paths during your time at Langara. The Art Institute of Vancouver’s courses were designed by focusing on the skills you, as the student, will need in order to enter the professional sphere. Some of the common courses you’ll take are: Color and Design Fundamentals, Layout and Concept Design, Digital Illustration, and Interactive Motion Graphics, just to name a few. Your Graphic Design concentrations will expose you to Advertising Concepts, Art Direction, Business of Graphic Design, and Form and Space (advanced layout) Design, among other topics. If you know this is what you want to do, if you have some talent with visual concentration but want to hone your skills and access some tools, consider the Art Institute of Vancouver.